In 1945, Claire Randall is back from the war and reunited with her husband on a second honeymoon in Scotland. 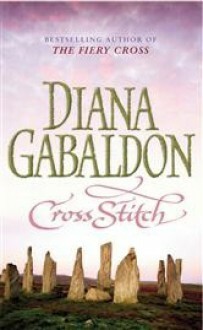 Innocently she walks through a stone circle in the Highlands, and finds herself in a violent skirmish taking place in 1743. Suddenly she is a Sassenach, an outlander, in a country torn by war and by clan feuds. A wartime nurse, Claire can deal with the bloody wounds that face her. But it is harder to deal with the knowledge that she is in Jacobite Scotland and the carnage of Culloden is looming. Marooned amid the passion and violence, the superstition, the shifting allegiances and the fervent loyalties, Claire is in danger from Jacobites and Redcoats - and from the shock of her own desire for James Fraser, a gallant and courageous young Scots warrior. Jamie shows her a passion so fierce and a love so absolute that Claire becomes a woman torn between fidelity and desire, and between two vastly different men in two irreconcilable lives.